Cadalog’s parts libraries v4.1.1 for AutoCAD, Inventor, SolidWorks and SolidEdge have been updated and are offered for free from OhyeahCAD.com until the end of March, 2006. The parts libraries contain parametric programs to create thousands of 3D mechanical and structural components, such as bearings, bolts, screws, steel shapes and gears in ANSI, ISO, JIS and DIN standards. There’s also catalof from 52 manufactures. To start a command from a menu, choose it from the list of menu options available. The available menu options depend on the experience level that is set. The advanced experience level is the default. Menu selections shown in this guide are based on the advanced experience level unless otherwise noted. To change the current experience level, choose Tools > Options, and then click the General tab. To start a command from a toolbar, click a tool and respond to the prompts. NOTE The available toolbars depend on the experience level that is set. To change the current experience level, choose Tools > Options, and then click the General tab. Some tools, such as Line or Arc, contain flyouts, which are options either for using the basic tool with different methods or that contain other, related tools. Flyouts are indicated by a small triangle in the lower right corner of a tool. To display a flyout, click the tool and hold down the mouse button. To select a tool from a flyout, point to the tool you want and then release the mouse button. The tool you select on the flyout becomes the default tool on the toolbar. 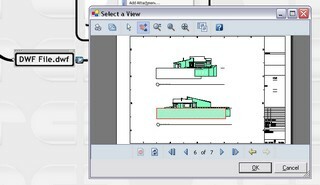 In September 2004 I blogged about a free MindManager for AEC Add-In. 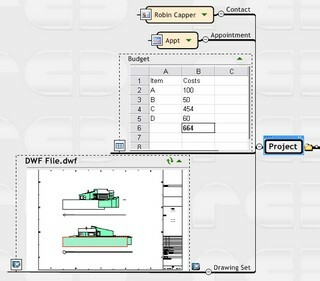 This allowed Autodesk Design Web Format (DWF) files to be integrated into MindManager Maps. It was a technology demonstration from Mindjet rather than a release candidate product but showed the potential of combining CAD and Map information to manage a project. The MindManager for AEC Add-In has been updated for MindManager 6 Pro and is now available from Mindjet Labs. Mindjet Labs showcase examples and prototypes Mindjet have developed internally for extending MindManager. Again it’s a technology demonstration rather than fully fledged application but well worth a download if you use DWF and MindManager. MindManager 6 introduced a new object in the form of a Business Topic. These allow “containers” of information from external sources to be integrated into the map retaining a link to the source. The DWF Topic converts a standard MindManager Topic, with hyperlink to a DWF file, into a Smart Map Part. 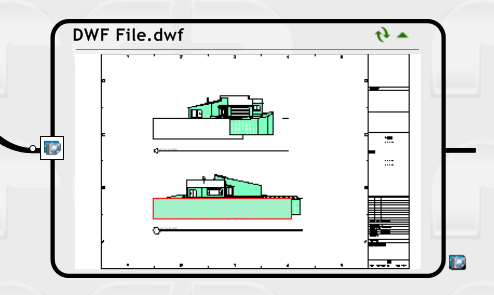 From the DWF Topic you can open the DWF, change sheets, copy and print using a small integrated DWF Viewer component. It uses the DWF viewer installed on your system and offers all the controls seen in the full application in a compact interface. 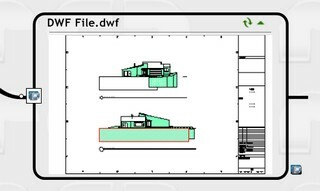 It’s ideal for quickly opening a DWF, to print or a quick image copy/paste. For more involved viewing you can still launch the full viewer from the topic hyperlink icon or right click>Full view in the viewer component. The image below shows a simple project using the DWF Topic combined with other smart topics. As I work on multiple projects gathering key information like this in a simple accessible format makes finding “the right stuff” easy and fast. I tend to only add info that’s “vital” and let the structure grow as the project demands rather than having any template or rigid structure. The Project topic has a link to the project folder on the server. The appointment & contact are smart part links from Outlook, the Budget is a spreadsheet topic and the DWF File shows the drawing(s). You can rapidly access any of them with a simple click. This is a nice way to collect information related to a project and it’s easy to share with other MindManager users with the application/viewer or anyone via export to Web/Office formats. Drag a DWF into the map to create a standard MindManager topic with hyperlink (as any file-type does) or add a DWF file hyperlink to a topic. You are presented with the “Select a View” window. By default the first sheet is used as the topic image. In multi-sheet DWF’s you can select the sheet you wish to see. This screen-shot also shows the DWF viewer interface when the business topic is opened. The Topic Menu (Left) has refresh options. Click on the image to launch the topic viewer with the same controls/options as your DWF Viewer. Clicking on the hyperlink icon (Right) opens the DWF with the full DWF Viewer application. It also displays a tool-tip with file details. NOTE: This is a technology demonstration from Mindjet Labs. The current build may not handle 3D DWF’s or have some problems depending on your combination of graphics drivers/hardware. Read the notes on the download page. If you have any comments after trying the add-in use the Give us feedback link on the download page to report back to Mindjet Labs. Install the Microsoft .Net Framework 1.1 from Windows Update if you haven’t installed it already. â€¢ Choose a command from a menu. â€¢ Click a tool in a toolbar. â€¢ Type the command in the command bar. Some commands remain active until you end them, so you can repeat an action without having to select a command repeatedly. You can end a command by clicking Done in the prompt box or by pressing Esc.